ABC Shapes combines learning the alphabet with fun and quirky shapes, going beyond the typical circles and squares to introduce arches, ellipses, cubes, wedges, and even helixes and nanagons. Learn about unusual shapes along with the alphabet in ABC Shapes, a fun and educational board book that combines the ABCs with fun and unconventional shapes. Going beyond the typical preschool shapes like circles and squares, ABC Shapes introduces arches and ellipses, cubes and wedges, and even helixes and nanagons. Each page highlights an unusual shape, one for every letter of the alphabet, and features a colourful illustration. 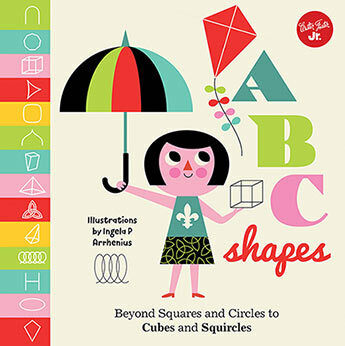 The beautiful and engaging illustrations of animals, people, and objects prominently feature each shape, ensuring parents and children love learning the fundamentals of shapes and the alphabet together.